The shady-forested area of shoe-gazing-pop has long since disappeared from the musical landscape. Slashed and burned by electronica, hip-hop and the rise of clean-edged indie pop. The only way to teach the young of this beautiful, naturally electronic phenomena is to paint it. 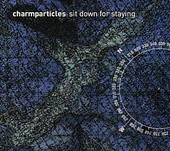 Charmparticles are the Bob Rosses of this age of nostalgia, breaking down the complexities of shoe-gazing, and making it seem like everyone can do it. Many of you readers might be thinking that I'm giving them a bad review, but I have a healthy respect for Bob Ross, many-a-time my paintings never turned out as beautiful as what I saw on PBS. Ross just made it look so effortless and easy and that's what Charmparticles do for shoe-gazer music. Check out "A/O" for a prime example. Bassist's Pamela Rooney soars her vocals throughout this song and you get so lost in her beautiful intonation that the song disappears as quickly as it started. You're shocked that it clocks in at seven minutes. "Phone and Finder" rolls along until the distortion kicks in and Charmparticles show you all the talent that this band has collectively. The only thing bad about Sit Down For Staying is that it is only an EP, expect more from this band. A lot more.